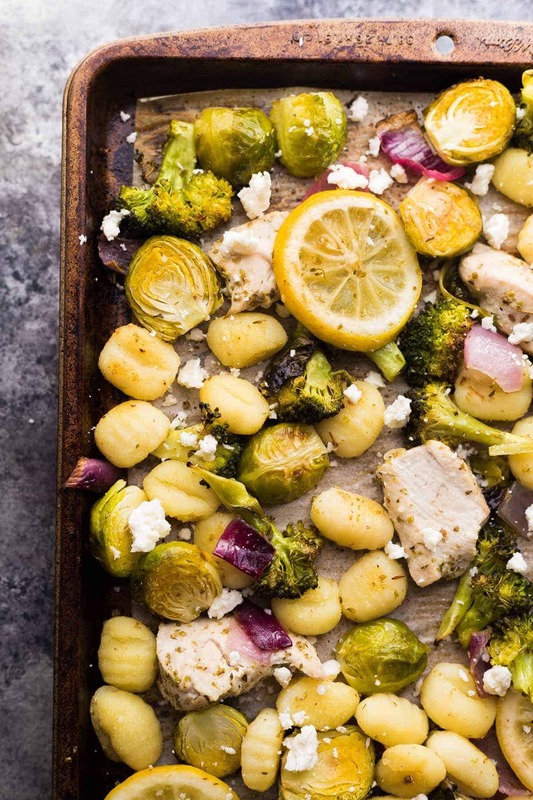 This lemon chicken sheet pan gnocchi cooks up on one pan for easy prep and clean up! 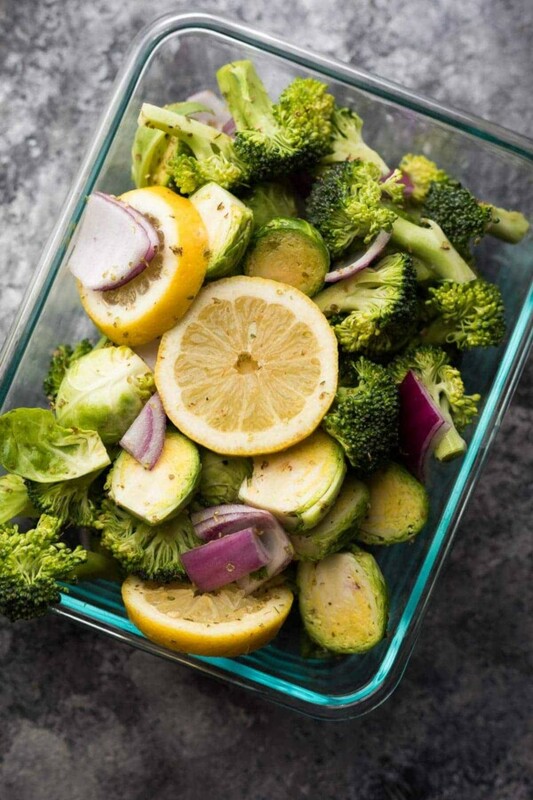 You can prep the vegetables up to 3 days ahead for an even quicker prep. Making my breakfasts and lunches ahead has been such a game changer for me that I have now set my focus on dinners. When I went back to work full-time after having Kai, dinners were an absolute nightmare. Often we wouldn’t have anything thawed out, and we wouldn’t even have a clue of what we would be eating for dinner…as of 5 pm. I know I’m not alone, dinners can be so hard, especially when you’re tired and hungy. So make ahead dinners are my focus for 2017 on the blog. 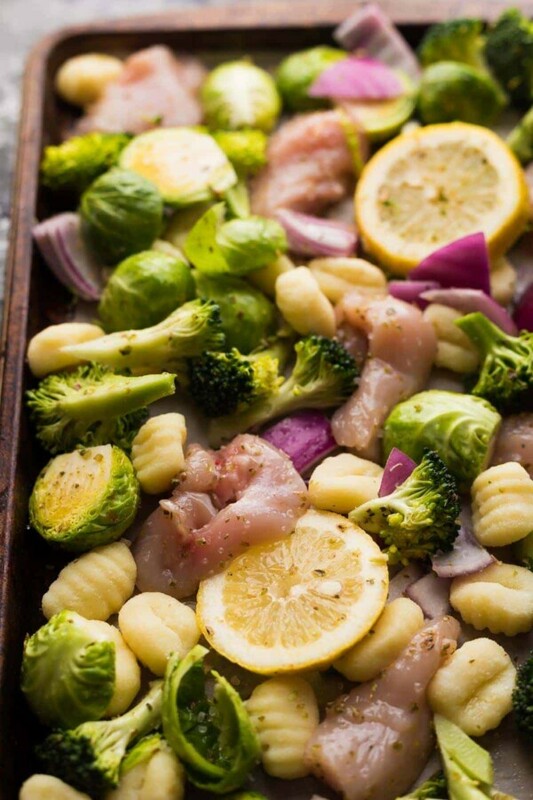 And I have another one for us today: this make ahead lemon chicken sheet pan gnocchi! You guys know I love my gnocchi…pan-fried to crispy perfection. Evidence: this One Pan Gnocchi with Sundried Tomatoes and White Beans, and this summery Caprese Chicken Gnocchi Skillet. But when I saw that you can roast your gnocchi? Mind blown. You can also pre-chop the chicken, though I would store it in a separate container from the veggies. 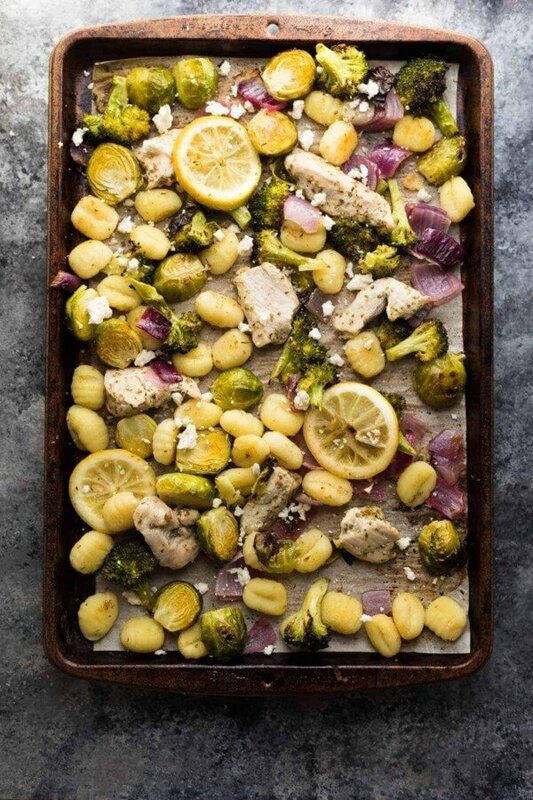 When you’re ready to cook up this lemon chicken sheet pan gnocchi, simply toss the veggies and chicken together with a package of gnocchi (add some extra olive oil if needed), then spread out on a sheet pan. Sprinkle with sea salt just before roasting, so that everything gets nice and seasoned. And roast! So basically, all you have to do is stir some stuff together and spread it on a sheet pan and put it in the oven. Easy? Check. Tasty? CHECK! While the gnocchi does not get the crispy texture that the pan fried gnocchi gets, it does get a nice chew to it. Sometimes gnocchi can end up too soft for my taste but this gnocchi is nice and firm, and gets a lot of nice flavor from the lemon slices and some feta cheese that we sprinkled over everything. Another easy make ahead dinner that you can add to your meal prep routine! Have a great weekend, friends! To bake right awayHeat oven to 425°F. 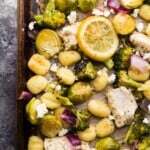 Toss the onion, broccoli, brussels sprouts, lemon, gnocchi, oregano and olive oil together. Spread out on a large baking sheet (you may want to use two baking sheets). Bake for 10 minutes. Toss the chicken strips with 1 tablespoon of olive oil and add to the baking sheet. Sprinkle evenly with the sea salt. Bake for 15-20 more minutes, until chicken is baked through and veggies are soft. Sprinkle with feta cheese and enjoy. 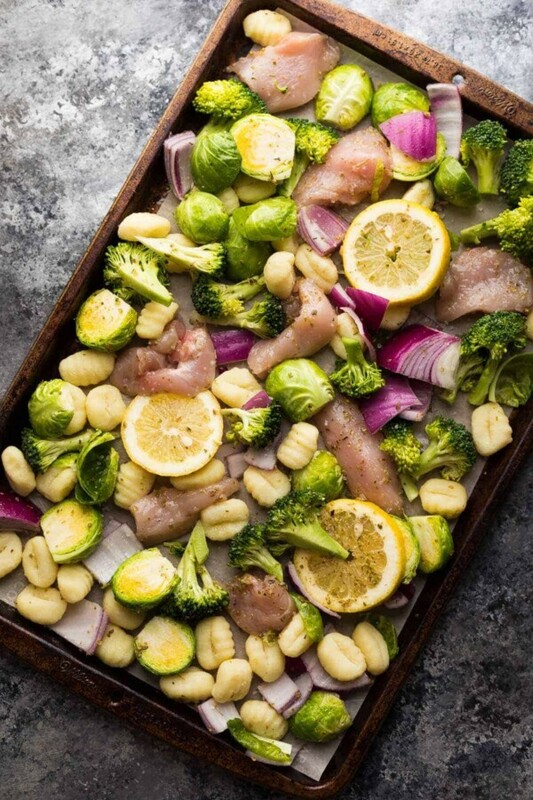 To assemble ahead:Toss the onion, broccoli, brussels sprouts, lemon, oregano and olive oil together (leave the gnocchi in the package until you're ready to bake). Store in the fridge in a well sealed container for up to 3 days. The chicken can be pre-sliced and stored in a separate container. When ready to bake, add the gnocchi to the veggies, chicken, toss evenly (add more olive oil if needed), and bake as indicated above. Hi, If using this as meal prep for work lunches, is it meant to be eaten hot or cold? ie can it be reheated and how long will it last in the fridge once cooked? Hi Joanne! It’s up to you but I personally would probably heat it. The gnocchi should keep for a few days…I’d say 2-3 days? Delicious and easy… my kind of recipe!! Looking forward to making this but my husband bought frozen gnocchi. Can I still use? Hi Nicole! I’m not actually sure…I haven’t tried. You could do one test gnocchi and see if it starts to get crispy, and if it ends up not working out you could always cook in the water? This is the first sheet pan recipe I’ve ever made, and it came together perfectly. The flavour is so tasty, and the fact that you can prepare it mostly ahead is a huge plus. Lots of veggies too, which I always look for in a good recipe. We love gnocchi! but our comes in a vacuum seal package so do I need to boil mine first and then put on the baking sheet? This recipe is incredible! Thank you so much for sharing. Made it once, and already excited to make it again. It was so easy to make, though I will admit I made it even easier by using frozen veggies and skipping the chopping step. Definitely a recipe to add to the weekly list! So happy you liked it, Lauren! I made this as my lunch for the week and I must say, it’s INCREDIBLE. It is the easiest lunch I’ve ever prepped. I can’t imagine people getting bored of this recipe every day, I would actually look forward to eating it again. I just finished my 4th portion and am genuinely bummed that I have to have something else for lunch tomorrow 🙁 thanks for this!! I’m so happy you liked it Madeline! Hurray for easy prep, right? This was really good – love all the veges in this! I count my macros so I was a bit concerned adding the gnocchi and feta – but it was well worth it! I like my chicken seasoned a bit more – so would just make that variation next time. Thanks so much for the recipe! Beautiful. Colorful. Delicious. Simple. I couldn’t love it more! This looks delicious and easy. Thanks for the recipe. I can’t wait to try it.